Double bill of family films from Disney. 'Saving Mr. Banks' (2013) is based on the life of author P.L. 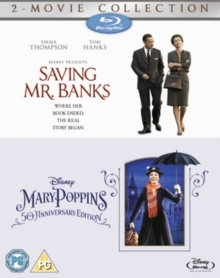 Travers (Emma Thompson) and Walt Disney (Tom Hanks)'s attempt to gain the rights to adapt her novel 'Mary Poppins'. In 1961, when her book sales begin to decline, Travers reluctantly enters into negotiations with Disney, who promised his daughters 20 years previously that he would turn their favourite story into a movie. Initially Travers is unyielding and flashbacks to her childhood in 1907 demonstrate why her novel and, in particular, her eponymous character are so precious to her. Eventually she agrees to let Disney go ahead with the movie but will she approve of the final outcome? The cast also features Colin Farrell, Paul Giamatti, Jason Schwartzman and Ruth Wilson. Thomas Newman received an Oscar nomination for his score. In the musical 'Mary Poppins' (1964), based on Travers' book series, stuffy parents in Victorian London are looking for a nanny, but the children write their own ad which is torn up and thrown into the fire. Miraculously, the paper reassembles and floats up the chimney flue and along comes Mary Poppins (Julie Andrews) on her umbrella/parachute. She brings fun and magic to the children's lives, as well as a guiding hand. The film won five Oscars including Best Actress (Andrews), Best Original Score and Best Song ('Chim Chim Cher-ee').